Loctite EA 3421 А&B Hysol - 2-part, clear amber, general purpose epoxy adhesive which cures slowly at room temperature after mixing. It develops high strength and excellent moisture resistance. LOCTITE® EA 3421 is a 2-part, clear amber, general purpose epoxy adhesive which cures slowly at room temperature after mixing. It develops high strength and excellent moisture resistance. 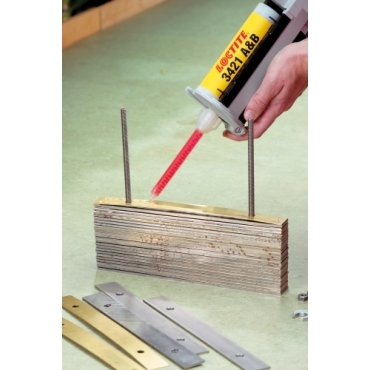 The gap filling properties make this adhesive system suitable for rough or poorly fitting surfaces made from metal, ceramic, wood or rigid plastics. The long working life and medium viscosity make this adhesive system suitable for large surfaces and where adjustment time is needed after assembly. Applications include bonding aluminium window frames and GRP panels.